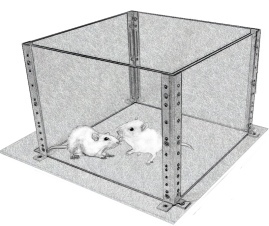 The social recognition task in the rat is similar in design to the spontaneous novel object recognition task; however, it offers the advantage of evaluating "recognition memory" in the domain of social cognition. Social cognition in humans is of great importance and its impairment in conditions such as Alzheimer's Disease and schizophrenia can have devastating consequences for the patient and their family/caregivers alike. In the most common version of the task, an adult male rat is allowed to interact with a juvenile rat for a specific amount time. The juvenile animal is then removed from the testing environment. Subsequently, after a predetermined delay interval, the adult male is introduced to either a novel juvenile or the same juvenile rat. The level of social interaction with the novel and previously encountered juvenile rat is compared. Under normal circumstances the adult rat will spend more time investigating the novel juvenile. This task allows for the evaluation of memory for social information and the cues that identify individual subjects. The effects of aging, drugs, methods to model Alzheimer's Disease and schizophrenia (and other neuropsychiatric disorders) can be evaluated in this procedure.